Preheat oven to 350°F and line two 9-inch cake pans with parchment paper. Mix cake mix, sour cream, eggs, pudding, oil, water, and almond extract with a hand mixer until combined. Pour the batter into cake pans, divided evenly. Bake at 350°F for 30-35 minutes or until toothpick comes out clean. Let cool for a few minutes and then gently remove from pans and allow to cool on a wire rack while the almond glaze it prepared. Mix the glaze ingredients together while the cake cools. Once cake is still warm but has cooled slightly, xxxxx the cake with a large fork or the back of a wooden spoon. Spoon the glaze over the two round cakes letting it sink in. Save about 1/3 or so of the glaze and set aside. Whip cream with the powdered sugar, using a mixer until soft peaks form. To assemble the shortcake place one of the glazed cake rounds on a cake stand or large plate. Top with freshly whipped cream and a layer of strawberry slices. Top with the second cake, more whipped cream and arrange more fresh sliced strawberries on top. Next, drizzle the more of the almond glaze over the top and down the sides. Store in the refrigerator until ready to serve. Note: This can also be made in a 9x13 pan in a single layer. My birthday is just around the corner and every year since I was a little kid I request strawberry shortcake as my birthday cake of choice. I love strawberries! My mom said that she drank a strawberry shake every day in the hot Arizona summer towards the end of her pregnancy – so I guess it’s an obsession that started in the womb. This Strawberry Shortcake with an Almond Glaze has become my favorite version of my birthday cake. This cake is made easily with a doctored up cake mix that results in a moist, dense cake almost the texture of pound cake. When the cake has just finished baking, holes are poked in the warm cake and drizzled with a sweet almond glaze that sinks down into the cake infusing it with almond goodness all throughout. 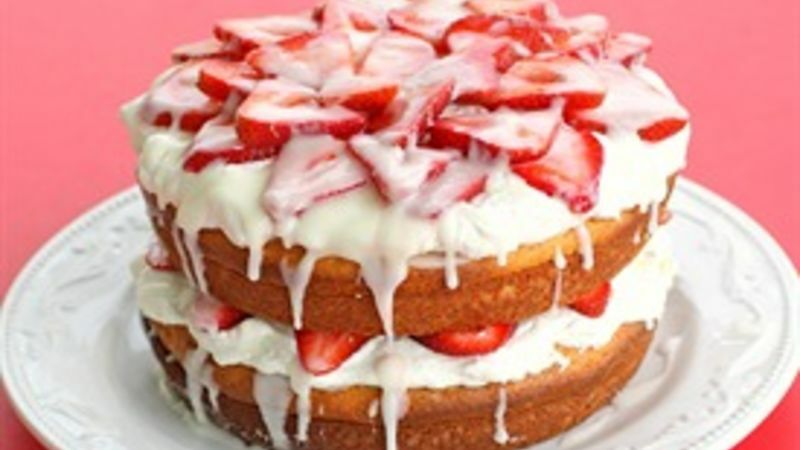 The cake is then lathered with a thick creamy layer of fresh whipped cream and decorated with sweet sliced strawberries. More almond glaze is drizzled on the top and sides of the cake for a unique twist to the classic strawberry shortcake. The almond flavor is a surprising compliment to the strawberries. Get your fork ready! Taking this to a Get Together? Although the double layer cake is impressive, this cake can also be made in a 9x13-inch pan for easy portability and sharing for parties or gatherings. Although the double layer cake is impressive, this cake can also be made in a 9x13-inch pan for easy portability and sharing for parties or gatherings. Cakes are an old-fashioned picnic favorite for good reason. Everybody likes cake, and they feed a bunch. Here are a few to try this summer.